The French winger delivered his finest performance in a Barcelona shirt in the La Liga leaders’ 3-1 win over Leganes on Sunday, but was forced off injured after 69 minutes. For the first time, the 21-year-old looks like the future of Barcelona and not just a costly transfer market blunder. Barcelona shelled out 147 million euros for Dembele in the summer of 2017 and then 160 million for Philippe Coutinho in January 2018 as they tried to fill the hole left by Neymar after his move to PSG. A year later it is becoming clear that Dembele was the wiser investment of the two, even though for months he looked like an over-priced panic buy. An icy night in Catalonia only brought out 50,000 Barcelona fans, filling little more than half of the stadium, and they would have been dismayed to find five-time Ballon d’Or winner Lionel Messi named as a substitute. Messi is one of the reasons people go to watch the club and, with the visitors not particularly attractive opponents, at the end of a week where Barcelona hosted two other small sides in Eibar and Levante, his absence from the line-up was a blow. However Dembele took to the pitch determined to impress in the Argentine’s absence, operating on the right wing instead of the left, a position which he seems to prefer. And on multiple occasions in the first half, Dembele got the fans to their feet with sublime moments of skill. This season Dembele has performed well, even if misdemeanours and poor timekeeping earned him negative press. However his team-mates have always supported him and pledged to help him adapt to life at the club, knowing his vast potential which is just waiting to be unlocked. Perhaps without the pressure of playing with Messi, which must be daunting, Dembele felt more comfortable. Or perhaps had Ernesto Valverde had handed him the keys and told him to drive. 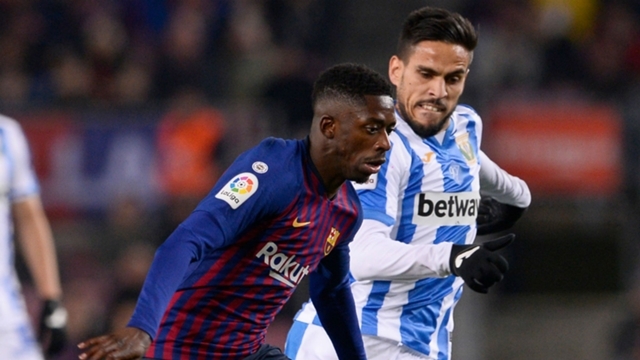 Dembele ripped into Leganes time and time again, attempting 12 dribbles in the first half alone, completing eight of them. That didn’t mean he was one-minded or selfish, as Dembele participated in small, combination moves when the time was right. The forward broke the deadlock in Messi-esque fashion too, feeding Jordi Alba and receiving the ball back from the defender with whom the Argentine shares a special connection, finishing expertly. Encouraged by Dembele’s excellent display Valverde kept him on the right flank after bringing Messi on in the second half, but a couple of minutes later the Frenchman fell to the turf injured. Barcelona will be praying it is not a serious problem because Dembele offers them solutions nobody else in the squad can provide. If Messi has lost half-a-yard of pace over the years, Dembele more than brings it back. “Dembele is at a very good level and has been improving since all the controversy. I hope the injury is as minor as possible,” said midfielder Sergio Busquets. Luis Suarez and Messi struck to ensure Barcelona took three points here but if Barcelona want the treble, the man who looked like trouble will be crucial.